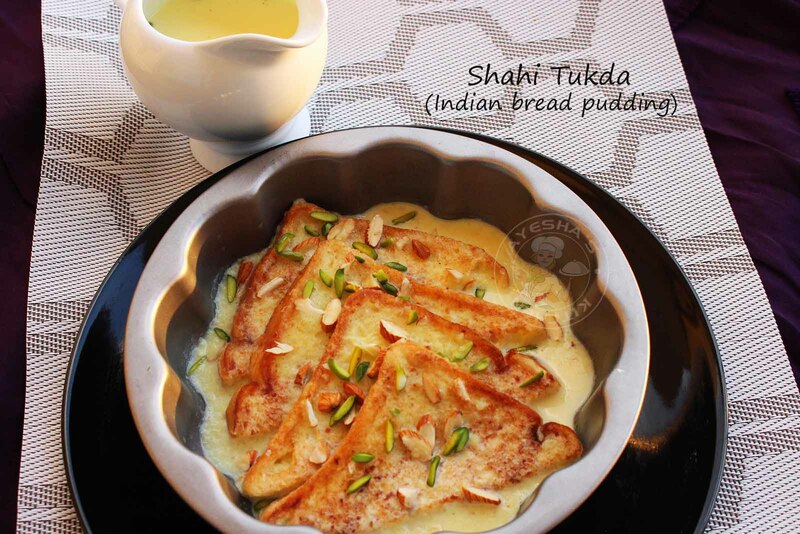 Shahi tukda / Shahi tukra is an Indian bread pudding dessert which has its roots in Mughlai cuisine. It is very similar to one of the popular desserts in Hyderabadi cuisine which is served at weddings and parties...Double ka meetha. Double ka meetha refers to the milk bread / double roti which doubles its size while baking. 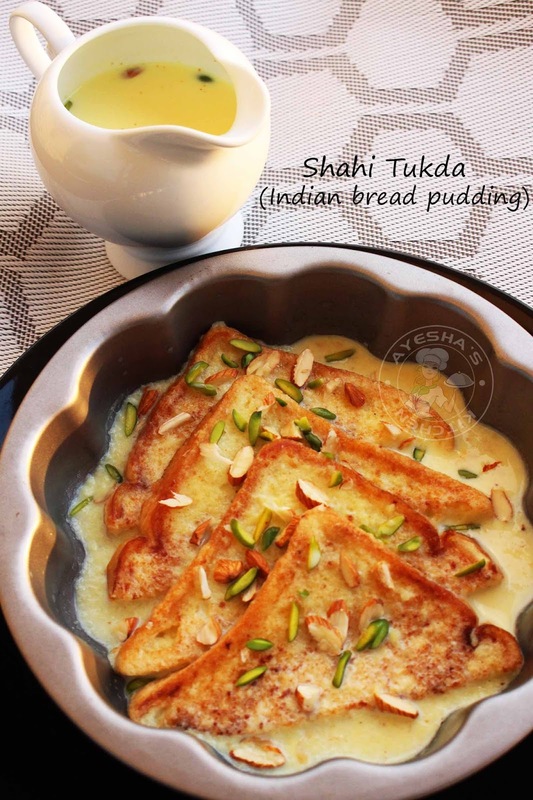 But for shahi tukda recipe, you can use any normal bread. This dessert is particularly prepared during the holy month of Ramadan and on eid. The recipe uses bread, condensed milk and dried nuts as main ingredients. Desserts are something which can reduce our stress. Whenever I crave for some desserts or sweets, I put my hands on bread as it is the most versatile ingredient for making some sweets or desserts. You can check my blog for various snacks and desserts recipes with bread. And here comes the yet another easy and super quick recipe with bread that tastes yumm yumm...This dessert is very popular and known for its rich yummy taste. Here the bread slices are toasted until crispy which is dipped in saffron flavored milk mixture (rabdi) topped garnished with nuts and served chill. Normally bread slices are deep fried until crispy but still, you can toast them until crispy in less ghee. Anyway the bread slices must be crispy...So let's see how to make shahi tukda recipe / easy indian dessert recipes / easy bread pudding recipe /recipe bread pudding/shahi tukray recipe. Heat a pan and toast the bread slices by adding little by little ghee. Toast until crisp over a medium-low flame. (Deep fried bread slices in ghee taste better but for those who are calorie conscious, just toast instead.) You can cut the bread diagonally or round or can use as it is before toasting. When done, set aside. Now boil milk in a saucepan. Once it starts boiling, reduces the flame and then add saffron (optional), cardamom powder, condensed milk, sugar and breadcrumbs. Cook for 15 minutes over a low flame until the milk thickens. (add sugar as per your preference, I don't have a sweet tooth and so I prefer to use less sugar). Place this toasted bread slices in a serving dish, pour the prepared milk mixture over it and keep refrigerated for an hour or more. While serving to top it with chopped pistachios and almonds. Simple, quick and yummy sweet treat ...right? ?